Ultraviolet (UV) radiation that reaches the earth surface has increased substantially in the past decades, altering insect–plant interactions by directly affecting herbivores behavior or indirectly by modifying plant chemistry and morphogenesis. 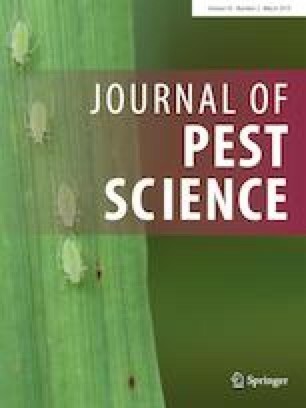 We evaluated the indirect effect of supplementary UV radiation under glasshouse conditions on Bemisia tabaci settlement, eggplant (Solanum melongena L.) production and its effects on the flight activity of Nesidiocoris tenuis and Sphaerophoria rueppellii. Eggplants were daily radiated with different supplemental UV treatments, A +/B +, A −/B + or A −/B −, during 30, 60 or 90 min for 21 days. The whitefly settlement was assessed immediately after the UV treatments or after 18 extra days on plants kept under regular glasshouse conditions with no further supplemental UV radiation. The number of whitefly settled on plants was counted after 2, 6, 24 and 48 h. Supplementary UV radiation reduced whitefly settlement for all exposure times with alterations on the morphology and increased nitrogen and amino acid content of eggplants, mainly after 90 min of UV radiation exposition. When plants were allowed to recover under regular light conditions, growth traits were similar, and whiteflies showed no preference. Fruit parameters were not negatively altered by supplementary UV radiation. Natural enemy captures per sticky trap were more abundant under A −/B + and A +/B + conditions; however, indirect host preference tests indicated no differences among treatments. In conclusion, supplementary UV radiation could be used to reduce whitefly infestation in glasshouses at the early stages of plant development without detrimental effects on crop yield or beneficial orientation. The authors are indebted to Sandra Pla, Marina Morente, Irene Ontiveros, Andrea Wanumen, Miriam Gurpegui and Ignacio Morales for their assistance in the laboratory experiments. This work was funded by the Spanish Ministry of Economy and Competitiveness (AGL2013-47603-C2-1-R to E. Viñuela and P. Medina and AGL2013-47603-C2-2-R to A. Fereres). A. Fereres, A. Moreno, P. Medina and E. Viñuela are members of the Associate unit IVAS (CSIC-UPM): Control of insect vectors of viruses in horticultural sustainable systems. This article does not contain any studies with human participants or animals (vertebrates) performed by any of the authors.